The RBI recently proposed draft rules on compensation for CEOs and full-time directors at private banks. The aim is to discourage excessive risk-taking and ensure that rewards for senior executives in these banks are aligned with the risks taken by the banks. Compensation schemes are meant to address a problem referred to as the “principal-agent” problem where managers, who are the agents, may run the company in a way that advances their interests instead of those of the owners (the shareholders). A common solution to this problem is to offer managers rewards for long-term growth by designing compensation structures that include instruments like restricted stocks, stock options, pension plans and so on. On the other hand, compensation structures that are skewed towards higher salaries and performance bonuses reward short-term performance and may encourage management to boost immediate profitability but risk the future financial health of the company. The principal-agent problem is even more acute in the banking sector which often leads to excessive risk-taking by bank executives. Many studies have attributed the incentives generated by bank executives’ compensation programmes to the excessive risk-taking that led to the 2008 global financial crisis. The move by the RBI to modify pay structures for bank executives at a time the Indian banking sector is facing severe stress is, therefore, not surprising. Typically bank executive compensation is structured with a fixed component, a variable component and stock options. The RBI is proposing the following changes in variable pay: Total variable pay should be at least 50 percent of total compensation, stock options should be included in the variable component and capped at 200 percent of fixed pay, and a minimum of 60 percent of the total variable pay must be under deferral arrangements. The RBI argues that a higher variable pay component ensures more skin in the game. If a CEO’s compensation depends on the performance of the bank, he or she would be incentivised to ensure that the bank performs well. Currently, there are no fixed norms for computing fixed and variable pay for bank executives. An April 2018 study by Institutional Investor Advisory Services showed that variable pay across private banks stood at 49 percent of total compensation. This is in line with the trend across a broader basket of BSE 500 companies. The proposed RBI rules also mandate compensation clawbacks in cases of misreporting of bad loans and failure to adequately provision for bad loans. While most compensation contracts at private banks have a clawback option in cases of gross negligence or a breach of integrity by the CEO, it is rarely invoked. It is only recently, in the case of ICICI Bank, that its board approved a clawback on all performance bonuses paid to its former CEO, Chanda Kochhar, between April 2009 to March 2018 after she was accused of violating the Bank’s code of conduct. But why is the RBI involved in structuring compensation for private banks? It doesn’t concern itself with such matters in other industries, then why banking? Shouldn’t executive compensation be the responsibility of the bank’s shareholders? Banks are special institutions and very different from other businesses. Firstly, there is greater risk of financial instability when it involves banks. The 2008 global financial crisis, which originated in the banking sector, is a reminder of how critical this sector is to systemic risk. Secondly, banks are highly leveraged, meaning that they carry a lot of debt relative to the value of their assets. This leverage encourages excessive risk-taking. Thirdly, bank assets and liabilities are mismatched. The liabilities are customer deposits that must be repaid upon demand, while the assets are longer-term loans. No bank holds enough cash to meet all of its depositors’ simultaneous withdrawal demands and this mismatch of relatively illiquid assets with extremely liquid liabilities makes banks extremely vulnerable to runs. Any hint of a problem can quickly push a bank towards insolvency. It is, therefore, necessary and prudent for an informed regulator like the RBI to be involved in monitoring the risk levels in the banking system. But while constraining risk-taking is an important task for bank regulators, the appropriateness of using pay structures is still contentious. It is not clear that compensation affects risk-taking by bank executives. There has been renewed attention to executive compensation in the banking industry since the 2008 financial crisis. Most of the compensation reform proposals have taken one of three approaches: long-term deferred stock incentive compensation, mandatory bonus clawbacks on “inappropriate” risk-taking, accounting restatements or financial losses and debt-based compensation. The RBI proposal focuses on increasing the stock component (variable pay) of the executive compensation and the use of bonus clawbacks. Unfortunately, revamping compensation structures alone may not solve the problem of excessive risk-taking by bank executives. Recent research shows that there may be factors that have a far greater impact on risky behaviour than compensation. Bank size, for example, is positively correlated with risk-taking—executives at larger banks tend to take on higher risk. Bank leverage is also positively correlated with excessive risk-taking—banks with higher debt compared to equity tend to take greater risk. Let’s consider a simple illustration of how leverage affects risk-taking. Assume I start a project with Rs 1 of my own (equity) and Rs 99 borrowed from the bank (debt). This is a highly levered venture, and my incentive would be to take on a lot of risk because if the project succeeds, all the gains come to me and if it doesn’t, my loss is limited to my equity—Rs 1 in this case. If, however, I had started the project with Rs 50 of my money (equity) and Rs 50 in debt, then the propensity to take on high-risk would be reduced because my loss in case of failure would be more meaningful. The same logic applies to banking. 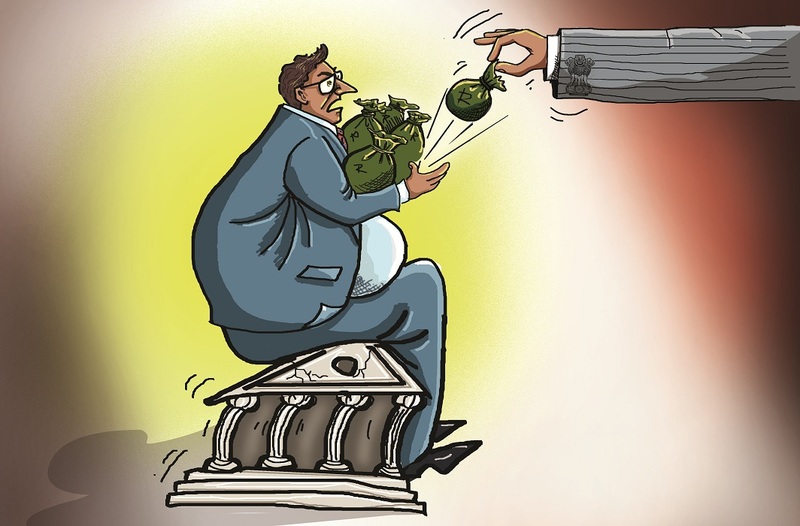 High leverage creates incentives to take on greater risk, especially in public sector banks where there is an additional moral hazard problem brought about by the backstop of capital infusion provided by the government. But policymakers are against increasing equity requirements for banks because they believe it will restrict lending and impede economic growth. Last year, 11 out of the 21 public sector banks in India were under the RBI’s prompt corrective action (PCA) regime for inadequate capital. The RBI wanted these banks to increase their equity before allowing them to engage in additional lending. But ever since the appointment of a government-friendly RBI governor in December 2018, six of the 11 banks have been taken off the PCA regime even though there has been no improvement in their equity position. While on the one hand the RBI is attempting to reduce risky behaviour by imposing restrictive compensation structures on private banks, on the other, it is allowing highly levered public sector banks to reengage in risky lending without an improvement in their equity position. The RBI’s proposal to increase the variable portion of a bank executive’s compensation to improve accountability may also backfire. Academic studies show that there is a greater incentive to cheat when a large proportion of a person’s pay is based on variable financial incentives. When there are financial rewards for hitting results that trigger a payout, it becomes attractive to game the metrics. Studies have shown that when a significant portion of a CEO’s compensation is based on stock options, it encourages short-term and unethical behaviour and increases the likelihood of earnings manipulations, product quality and safety problems. When people’s remuneration depends strongly on a financial measure, they are motivated to maximise their performance on that measure, no matter how. Another problem with the RBI proposal is that while it wants 60 percent of the variable pay to be under a “deferred arrangement”, it doesn’t specify the period for such deferral. Is the compensation deferred for two years or five years or up to retirement or beyond that? A recent study by University of Colorado professor Sanjai Bhagat emphasises that incentive compensation for bank executives should consist only of restricted stock and stock options—restricted in the sense that the executive cannot sell the shares or exercise the options for one to three years after his last day in office. This would induce them to focus on the long run and discourage them from excessive risk-taking. There is also the issue of what the RBI considers inappropriate risk-taking by banks. There is a unique tendency towards risk-taking in the banking industry—that is the nature of the beast. There are many companies that need to borrow capital, and evaluating future cash flows of these borrowers based on extrapolated balance sheets and industry trends involves a high level of uncertainty and estimation errors. There will always be bad loans in banking—it is an unavoidable problem given the nature of the industry. RBI’s proposed rules to use compensation structures to discourage bank executives from short-term and excessively risky strategies mirror the proposals of the Basel Committee on Banking Supervision. But they fail to address the unique problem that haunts the Indian banking sector: fraud, political cronyism and patronage. The primary source of India’s banking problems is excessive government control over banking assets, and using compensation reform to address executive risk-taking is missing the forest for the trees. Previous storyShould Judges Have a Feminine Approach?